As the annual kickoff to the July 4th celebration in Peachtree City, the parade is a production like none other in the area. There were plenty of sights, and even some sounds, in this year’s parade, along with plenty of golf carts. Among the carts was a rather large entry by the New Neighbors League of Peachtree City, whose double-decker “bus” won recognition as one of the best golf-cart entries. The creation was so large that some spectators wondered if there was a golf cart inside. There were also plenty of political candidates and office-holders with floats in the parade, as some chose to walk the parade route to briefly meet potential voters face-to-face and others decided to ride in their proudly-decorated floats. Much young talent was also on display during the parade, from dancers to local bands and the McIntosh High School marching band. The grand marshal’s trophy went to the Girl Scouts, whose float celebrated the 100th anniversary of the national organization that included a special birthday cake and an homage to summer camp. The Great Georgia Airshow had one of the more unique entries, flying a remote controlled plane along the route to keep awareness up for the 2013 event, as this year’s airshow was cancelled so time could be spent retooling the show. 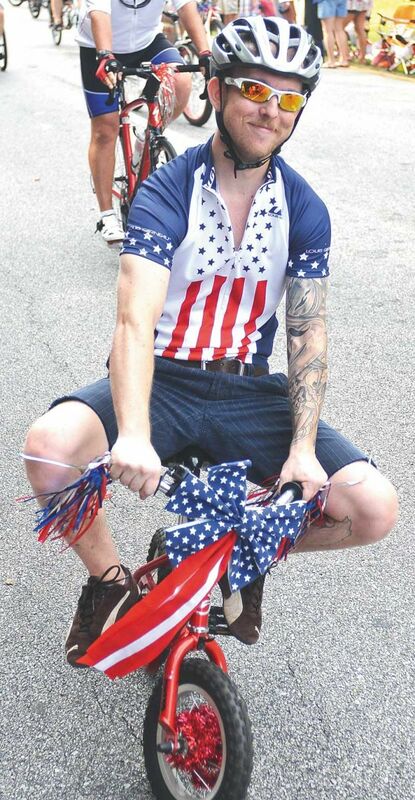 This year’s parade again saw some warm weather, and several Peachtree City EMTs patrolled the parkway on their specially equipped bicycles so they could respond to minor emergencies as needed. The grand marshals of this year’s parade were the leaders of the city’s three veterans organizations: Arnie Geiger, Commander of American Legion Post 50, Stony Lohr, Commander of VFW Post 9949 and Guy Mitchell, Commandant of the Marine Corps League Detachment 1325. 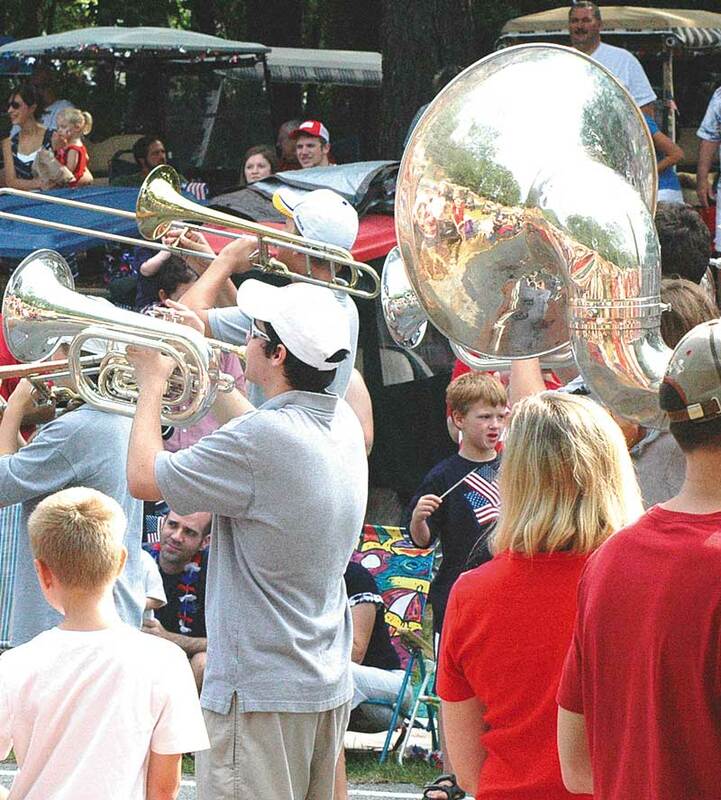 Parade organizer Becky Kimble said the organizations contributed significantly to the city’s efforts to celebrate Memorial Day and Veteran’s Day in Peachtree City. Photos from this year’s July 4 parade are posted on The Citizen’s Facebook page, available at www.facebook.com/mycitizen. While the parade is a joyous spectacle for all involved, beyond the hard work to decorate individual floats are the efforts of city staff to clean up the parade route following the event. The city’s public works department had 21 employees on the clean-up crew with an additional eight volunteers from Keep Peachtree City Beautiful as effort was made to recycle what waste could be reclaimed, according to Public Works Director Mark Caspar. There were trash cans along the route to empty, and of course the typical parade detritus of broken candy in the street that didn’t make its way to spectators and even some pamphlets and handouts from area businesses who took part in the parade. The city does use a street sweeper along the parade path but it still takes several hours to clean up after the parade, Caspar said. In fact the cleanup takes longer than the actual parade itself, Caspar confirmed. It also takes about two full days to set up for the fireworks and the parade in cooperation with the city’s recreation department and also the city’s convention and visitors bureau, Caspar noted. “It’s just everybody putting in a tremendous amount of time for the event,” Caspar said. The fire department also spent time assisting and hosting the annual “water wars” battle at Drake Field, which included participation from the Peachtree City Police Department and the Fayette County Sheriff’s Office. The event allowed children to get a feel for manning the fire hose as well, giving them a hands-on experience. The fireworks over Lake Peachtree capped off the night, but city staff wasn’t done when the last volley fired over the lake, as numerous police officers had to direct traffic, including a large number of golf carts of course. Girl Scouts in Service Unit 617 in Fayette County are celebrating the 100th Anniversary of Girl Scouts. They created a float for Peachtree City’s 4th of July parade showing many of the activities the girls enjoyed during their week of summer day camp, which included archery, canoeing, campfire cooking, crafts, songs, and games. The colorful and festive float won the Grand Marshal’s award. In Troop 11352: Samantha Birmingham; Brooke Birmingham and Rachel Reynolds. Amy Vassey is the Service Unit Director of SU 617. Girl Scouts will be forming new scout troops soon and are currently looking for both girls and leaders to join in the fun. If you are interested, email sud@peachtreecitygirlscouts.org or go to peachtreecitygirlscouts.org. Watch for more information about the recruitment event that will be held on Aug. 26th. Having grown and developed over the past 100 years, Girl Scouts is the premier leadership organization for young women to learn leadership skills in a fun, safe environment. Photo/Amy Vassey. 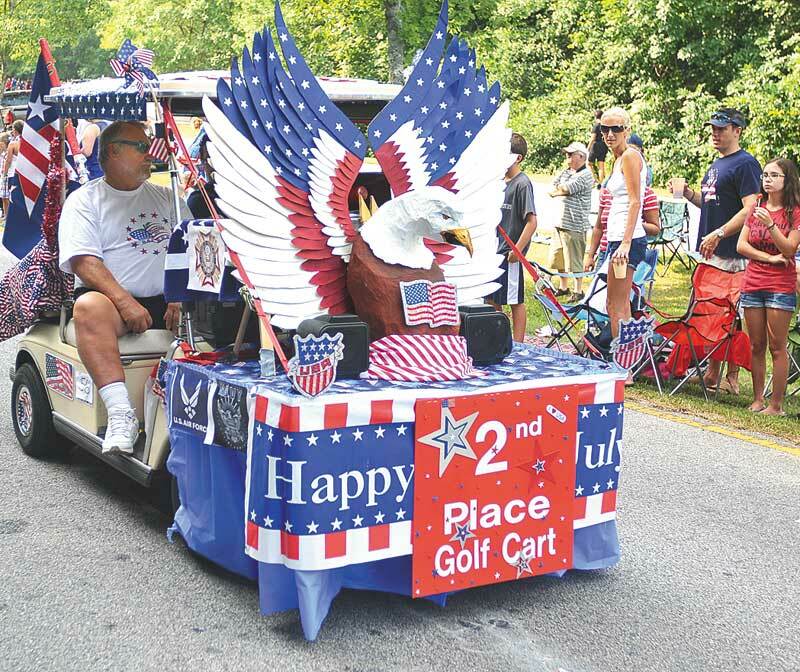 The New Neighbor League Club of Peachtree City won first place in the “best golf cart” category during the July 4th parade in PTC. 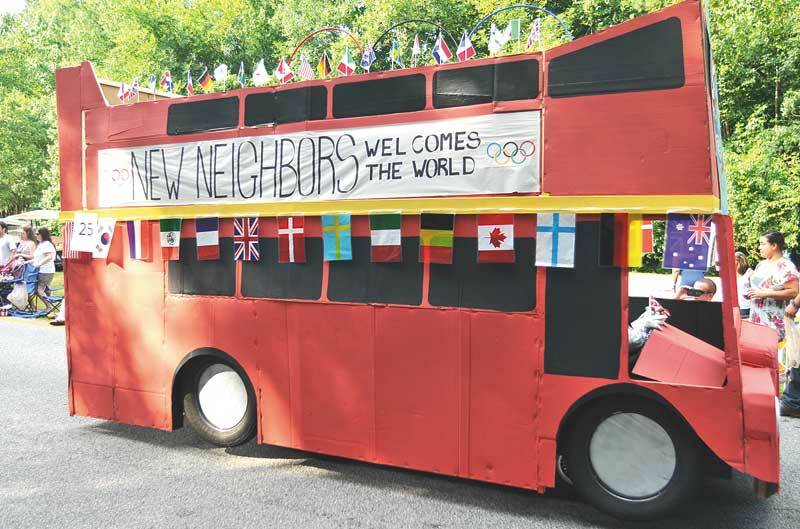 “New Neighbor League Welcome’s the World” was the theme which included a spin on the Olympics by including a British double decker red bus and the Queen’s carriage. Construction of this golf cart “wonder” began on June 25 and ended just hours before the parade began. Materials of construction included in the award winning entry were 12 cardboard garment boxes, 3 gallons of paint, 60 pounds worth of 2 x 4s and real tires.